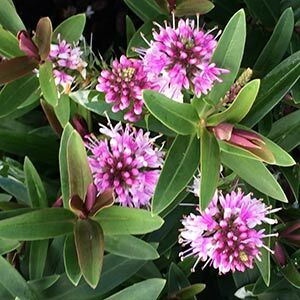 With green foliage and purple flowers, Hebe ‘Marie Antoinette’ is a small to medium plant. Another of the compact growing Hebes, it tolerates coastal conditions and is resistant to powdery mildew. The purple flowers contras well against the mid green foliage. Flowers themselves appear as short spikes to around 4cm (2 inches) in length. Foliage is a mid green, short and narrow, which adds to the compact look. With a subtle contrast between flowers and foliage, Hebe ‘Marie Antoinette’ fits in well with many landscaping schemes. Excellent for growing in containers. Plant to the same depth as Hebe ‘Marie Antoinette’ was in its container. Hebe ‘Marie Antoinette’ should be fertilised in early spring with a general purpose slow release type fertiliser. Hebe ’Marie Antoinette’ can be lightly pruned after flowering to maintain a more bushy shape. Height – 1m to 1.5 however can be pruned to .5m if required. Sun Shade – Best in Full to Good morning sun with a little light afternoon shade in warmer, drier areas. Flowering Period – Spring through summer.